A while back, a friend of mine asked if I had any posts on making preserves or canning jam. Well, this post is for her, thanks for asking, Lori. I don’t normally post this kind of thing on this blog, but it is good to have as a reference and is one of a few tutorials I wanted to get started posting anyway. Besides, we are still painting the garage and not showing much of anything right now in that line of work. I’m just hoping we get a whole first coat on before the weather changes. 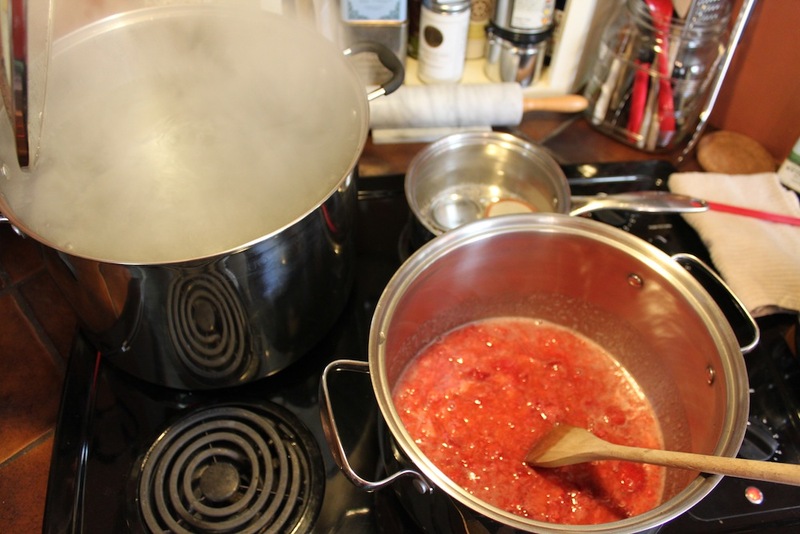 I learned how to make strawberry jam last year and how to can it properly. I got so into the process that I made apple jelly, orange marmalade, lime marmalade and quince jam before the year was out. This season, I thought I’d try to make some new flavors. I started with strawberry to get in the groove, so those are the pics and the process I’ll post here. For me, the process was all about knowing how not to poison myself and others so I learned from someone showing me first hand, which was GREAT. That is also how I’m learning to knit and how I learned to make really awesome cinnamon rolls. Learning from a seasoned woman is the best way, I think. Start with the all the tools you’ll need. This is huge. Get a lot of jars, in some different sizes. Get a few boxes of pectin, low sugar and regular Sure -Jell is my preferred choice. Get a canning pot, with a canning rack. 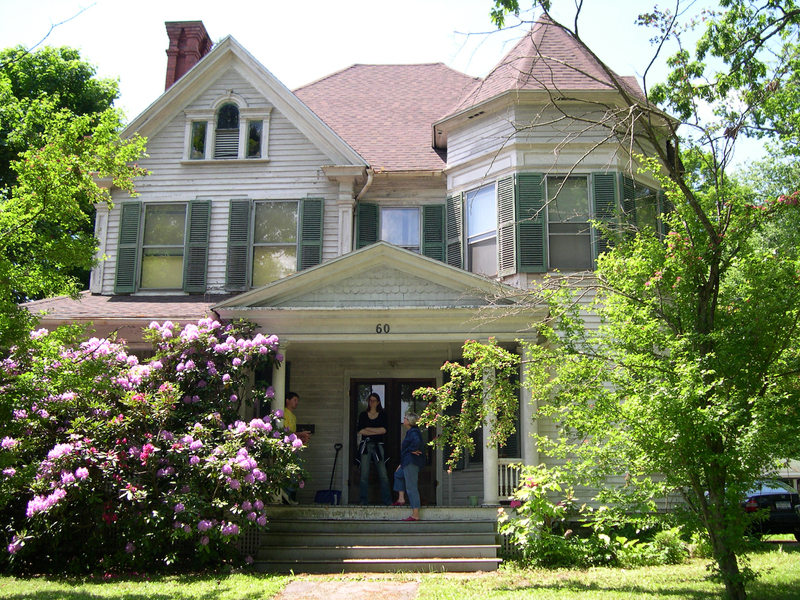 Bill bought one for me last year for Christmas –one of the best presents ever. Get a magnet to pick up lids out of the boiling water and a set of tongs made for picking up the jars. Have a wire rack for cooling jams and some kitchen towels on hand. Get a jam funnel and a ladle. There ya go. The hardest part is preparing the fruit, I think. For things like peaches or cherries, you have to remove stems or pits or peel. It can be daunting, so start with strawberries, so easy. Clean them, remove stems and mash them up. If I have fresh berries to use in June, I prepare them and then freeze the prepared fruit so that I can make the jam when the weather cools. Following the recipe either on the Sure Jell website, I’m ready to go. I’ve started cleaning all the jars I’m going to use, lids, rims and jars and turned them over. I’ve started the water boiling in the canning pot. It takes forever to heat up, so good to start early. Thaw out the fruit. 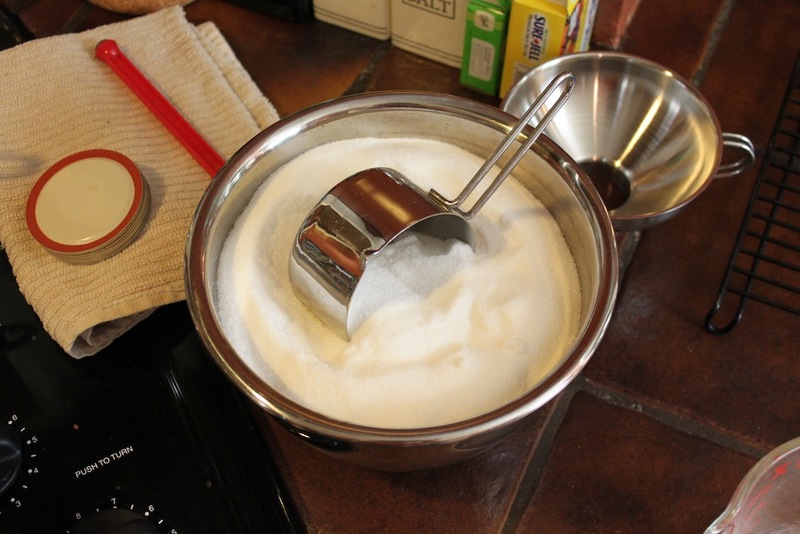 Prepare the sugar (put 7 cups in a bowl). Mix 1/4 cup of that sugar with the powdered pectin. Place the lids in another small pot on a back burner to boil and sterilize. Place the jars in the boiling water in the canning pot to sterilize. Then put the fruit in another pot to start cooking. Turn the fruit on high and mix in the pectin/sugar. Stir constantly until this mixture is at a rolling boil. Add the rest of the sugar and continue to stir. Just stir forever. Once this mix is rolling in a boil, time it to boil for one more minute. Then, turn off the burner, take the jam off the stove and skim the froth off the top. 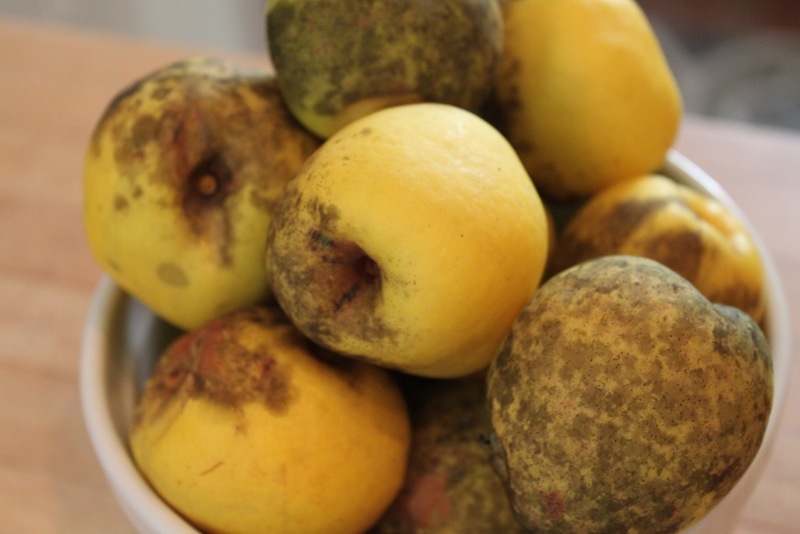 Some fruits make a lot and it is just sorta weird to have in your jam. Canning pot boiling jars, and me stirring jam. 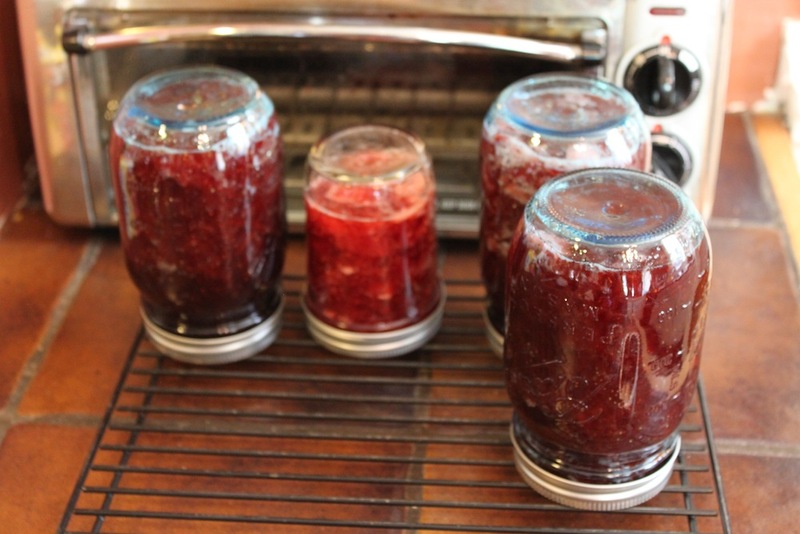 Then, quickly pull a jar out of the canning pot, fill it with warm jam up to 1/4″ from the top by using the ladle and funnel, wipe the rim, place on a lid and the tighten on the rim. Do this with all the rest of the jam into jars. If you have a little jam left, put it in a mug on the counter to see how it gels and you’ll have a fresh taste for when you’re done. This is the stressful part, doing this quickly and not burning yourself. But it is possible. At this point, you can turn the jars over on the wire rack to let them cool. This is safe with strawberry jam. But, I take the next step and boil the sealed fruit for 5 more minutes in the canning pot. This is a preventative step to avoid spoilage. Remove the jars once they are done, don’t over process and let them cool upright. Don’t shake them, just let’em gel. So far this year, I’ve made strawberry, apple jelly and cherry. I’m still planning to do peach, marmalade and maybe grape. Hi D! No need to seal with wax these days. 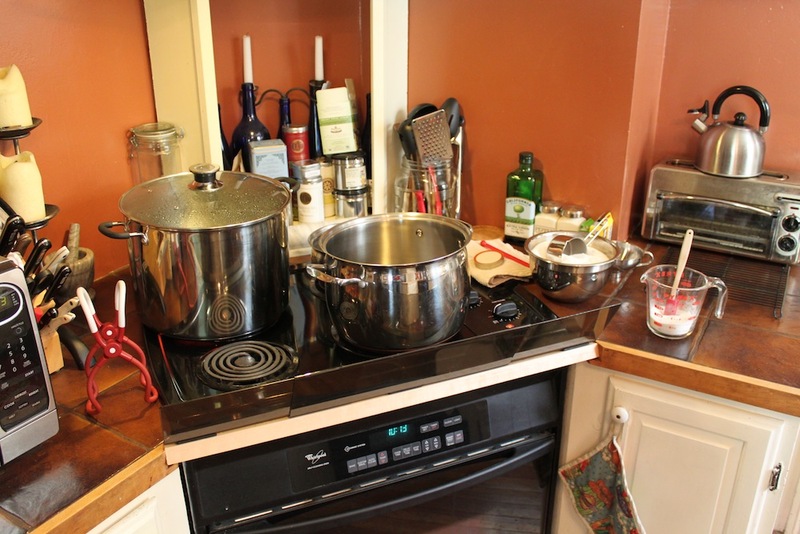 Boiling the jars after closing them prevents the spoilage. 🙂 It really isn’t that bad at all to do. I love it now that I know how to do it. Hugs! Quince jam and lime marmalade. Never had a Quince, but I like the word. But lime marmalade sounds great.